2 The Narrator Puts One Foot in Front of the Other. my existence would go on regardless. going from A to B on the Sour Hill Road. how else to deal with the boredom that life has become? you have to stare unblinking to catch it fall. at least for a fourteen hour shift. Gary Allen has published fourteen collections of poetry, most recently, Jackson’s Corner, Greenwich Exchange Publishing, London, 2016. He has published Three novels, Cillin, The Estate, and Twenty-Eight Worlds, and has also published Introductions, a collection of short stories. for your collusion are old newspapers. their anguish even further, like infection. while agencies ignore his room-mate’s phone calls. beside a whisky bottle nearly empty. a willing spiral into victimhood. pretend their promises of fashion-shoots. on a golf-course in the deepest rough. about a siege and showing you a half-burned house. A leather jacket, draped, half-hides a hopeless face. into roadblocks built with slabs of bad decisions. Michael Bartholomew-Biggs poetry editor of the on-line magazine London Grip. His most recent collections are Fred & Blossom (Shoestring 2013), a narrative of love and aviation set in the 1930s, and Pictures from a Postponed Exhibition, an evolution myth based on images by the artist David Walsh (Lapwing, 2014). His website is at http://mikeb-b.blogspot.co.uk/. the main gate of the crematorium. in time to watch at least one funeral. by clinging to despair. We’re private people. and pry is bad taste and a theft of knowledge. We keep no record of the time or date. When you decide to go please sign the book. You’ll find the tablets in your bedside fridge. between a moment and its memory. blood-glow of stained glass did so already. recall and attention out of kilter. has found its way again to unlit dust. by my plan to come back next time yesterday. for her to read or write or not. far below with stone steps to a deeper one. somewhere a long way off and tropical. which are the shreds of what she’s wearing now. with a leopard’s cough but with a woman’s smile. red bulbs above the warning notices. and over-sensitive and prone to worries. and on the surface of your mind like beauty. then press your forehead and begin to weep. though painful does not make us ghouls. or clinging to the sides of dark slow lorries. of the man who talks at us because he’s old. where he turns fretful and asks me the way. It’s off to bed for dolls and bear. is growing on the shoulder of his coat. It’s getting cold. He has a runny nose. We stand. His rise is lizardly. and I remember that I married him. It’s time to please myself. Perhaps to travel. and though he can’t make sense for sobbing speaks. for obfuscation when the need arises. of heart-break on the Morris rug. I could unbend and help him up. entirely into fashion and distraction. a while at least. Why not call back my luggage. Of course he is impossible to love. But he loves me. He’ll be the first of many. and blinks them in the light of Daddy’s money. All men are evil, but All men are the same. to what things actually are or were. as a marksman’s rifle. Seek clarity. then name it. Learn by heart all essences. of the riddle which makes everything the same. That finished Dad. And as for me? I dream all day of what I most resemble. Peter Bennet was born in Staffordshire in 1942. He has published six books of poetry and many pamphlet collections. He was a PBS Choice in 2008 and shortlisted for the T. S. Eliot Prize. He lived for thirty-three years near the Wild Hills o’Wanney in Northumberland, in a remote cottage associated with the ballad-writer James Armstrong, author of Wannie Blossoms. He now lives in Whitley Bay. His latest collection is Border, from Bloodaxe Books. There is more information about Peter Bennet on http://www.bloodaxebooks.com. he binds together with electrical tape. thread wires through fuses, repair and mend. then Epaderm, smoothed to sooth the pain. are Mulberry silk when they touch my skin. it far down in the atrium. tightly at the neck of her gabardine coat. ‘Was that wise?’, you seem to ask. Which makes us late for the reception. ‘Do I talk to him?’, I respond. His white suit and bow-tie fool no-one. Or are there limitations to disgrace? but what is the fish doing in my outstretched hands? remove stock from the closed-down record store. They are filling the milk-float nicely. that I can’t seem to gesture for help through these bars. Tim Dooley is reviews and features editor of Poetry London and a tutor at The Poetry School. His collections include The Interrupted Dream (Anvil 1985), Tenderness (Smith Doorstop 2004), Keeping Time (Salt,2008) Imagined Rooms (Salt, 2010). of that new England you had made your own. among us commuters, that glamourie. or visit temples, hills, shops. See any children. that tower over us . the empty sea on a four hour watch. the skipper said, would really like. All they get to do is walk on steel. in a flat street by a bland church. Between church and street, a lawn. I wonder, is the point? something strange has woken him. of something more than tension. to room, to stand at the window. a world in total night. and smeared by a sooty wick. that appears to stay the same. his own house, his face at the window. masking the sky, the promise of the day. above concrete trees – walls in golden leaf graffiti. sulphur rising in the blood stone pits of pig flesh. aluminium structures tremble where footsteps roam. City of glass – Towers of anatomy – a paper cut with no skin! listen to the foam, the sand. sentences out of the waves. of sky weaving through branches. Kate Garrett writes poetry and flash fiction, and edits other people’s – she is a senior editor at Pankhearst, and the founding editor of Three Drops Press / Three Drops from a Cauldron. Her latest fiction book, Bewitched and Other Stories, was released in August 2015 (Pankhearst) and her newest poetry pamphlet The Density of Salt is forthcoming from Indigo Dreams in 2016. She lives in Sheffield, England with her husband, cat, and three clever trolls who call her “mum”. veils and blankets of cloud. the Moon in a bucket. and the cold, transparent body, plant a foot on each bank, and pull. or a bloody belief in hope in years. This is your river. will hold the beast. Wed the river to its new path. Say, here’s your bed now, lie in it. and shaped by detritus licked up along the way, has gone. Try not to feel guilty about it. Changing structure is changed fate. with few straights. Allow it to seduce you. along its length, send out ripples, turn it against you. kicking a hilltop church down into inanimate rubble. Charles Lauder Jr was born and raised in Texas and spent several years on the East and West Coasts. However, he has lived in the UK Midlands for the past 16 years. His poetry has appeared internationally in journals such as: The North, Magma, Stand, Bare Fiction, The SHOp, California Quarterly, Poetry Salzburg, Under the Radar. His pamphlet Bleeds was published by Crystal Clear Creators in 2012. I’m not a performer and you made me nervous. you had no opinion on how it should be done. before I melt chocolate in a bowl over hot water. You marvel at the double-dipped biscuits. didn’t bother. I had to teach myself so I could show you. my mother is not watching. This is not her recipe. in three hundred and eighty words. until he split from a girlfriend. that got stuck in my head. It’s simply a love song. makes my journeys more bearable. but her copper tea set is saleable. Its style suggests the 1920s. too short to be decoded. while Marshall itched to get back to archaeology. of the seals in the 1924 Illustrated London News. not grand enough for dignitaries. taking a break between serving courses. Emma Lee‘s third collection is Ghosts in the Desert (Indigo Dreams, 2015) and she was co-editor of Over Land Over Sea: poems for those seeking refuge (Five Leaves, 2015). She blogs at http://emmalee1.wordpress.com and reviews for Sabotage Reviews, London Grip and The Journal. doing a good job hiding their aloneness. and cry it comes as music to his ears. Richie McCaffery lives in Gent, Belgium but was born in Newcastle, UK. He holds a PhD in Scottish Literature from the University of Glasgow, where he was a Carnegie scholar. He has published two poetry pamphlets, including Spinning Plates (HappenStance Press, 2012) with a third forthcoming in 2017. In 2014 Nine Arches Press published Cairn, his first full collection. He is also the editor of Finishing the Picture: The Collected Poems of Ian Abbot (Kennedy & Boyd, 2015). to cover these worked flints? what is all this that smothers them? to gather here and smother ours? proves permanence does not exist. of the pleasure once of some dream. and did no more than join their sinking orbits. and time and space will end. everything vital in the other’s privacy. of brilliant orange-gold lichen on the bark. among details that I will never see. only, ancient, decrepit dawn, let us go. A. F. Moritz‘s most recent book is Sequence (2015). Also in 2015, Princeton University Press reissued his 1986 collection, The Tradition, from the Princeton Series of Contemporary Poets. 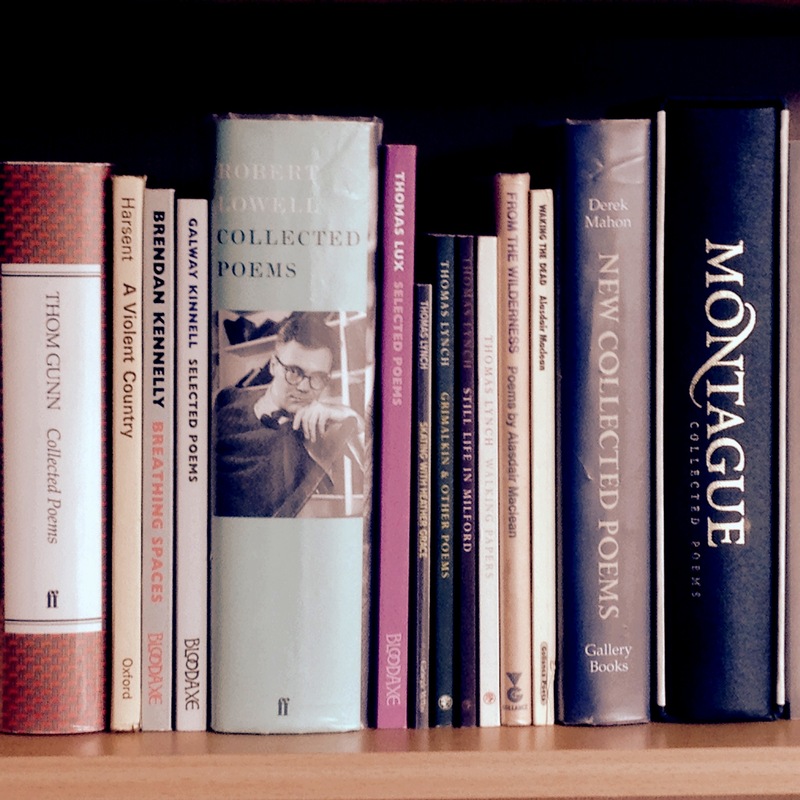 Moritz’s poetry has received the Griffin Poetry Prize, the Guggenheim fellowship, and the Award in Literature of the American Academy of Arts and Letters. in the sky, not in light years, foot by foot. I fall on the bed, I measure worms. is a touch of love and what love goes for. on the page or wall may be holy and a sin. proof we are not made to be alone. wrap their erogenous zones in barbed wire. it has eyes, can read, is remarkable. the stone watchtower became the first stone book. to catch a word, and then another word. where poets dressed in rags, or silk and lace. la chose écrite est une chose sexuelle. I had a woman beautiful as the letter l.
another thing, be defaced, after a while. a sexual sunrise that is not daybreak. on the cross of the letter T.
The letter of love is still the open-legged V.
How can I dot the i with humanity? Because I’ve lived beyond my years, I’m in the soup. I don’t spit in the soup from which I’ve eaten. with a fantasy he is Mars making war, not love. I read poetry and write garlic lines. my wife, crawfish, the catch of the day. sorry, but I went from soup to soup to nuts. sung by abused nannies and wet nurses. used as background to a solo improvisation. Eros daydreams beneath my window. my “Satyr Song,” he is my heir. but I’ve stolen more kindness than fire. Reader, keep out of mind my transparency. that may take the place of a mountain. You can see I’m in the soup. Eros, I leave you a checkbook of unsigned checks, my love. This is not the first time I’ve talked only in metaphors. It’s Thanksgiving, I give thanks. I can still carry a tune. I played soldier as a child. all murderers, good and bad on each side. I knew and remember their faces. that overflowed with the big ones of history. but in my game they all rose again. of my boyhood friend Gerry’s brains. had his spine made into an accordion. Stanley Moss is an American poet. He recently published It’s About Time with Carcanet. A group of poems will be published in the next issue of PNReview. He is editor and publisher of the Sheep Meadow Press. He makes his living as an Old Master picture dealer. He has a wife, Jane; two dogs, Margie and Honey; and three donkeys, Rebecca, Daisy, and Ludwig. You can find other information at www.stanleymoss.com. the dark drawer where the long fork lay. cabbage-white butterflies nibbling it all. Helen is making nettle paper. The quiet of the woodland is deceptive. of the lake’s glacial bowl, a very low hum. pierced with pins, a garment of shaming. under the cover of the stinging nettles. to Berlin, to bury John. has gone, leaving you alone here. With me. a lifetime of small jewels. banging of doors, and long silences. One day, a man sobbed on the balcony. of the old machine, the slap of grill doors. Mary Noonan’s poems have appeared in Poetry Review, Poetry Ireland Review, PN Review (forthcoming), The Dark Horse, Poetry London, The Spectator and The Threepenny Review. Her first collection, The Fado House (Dedalus, 2012), was shortlisted for the Seamus Heaney Centre Prize and the Strong/Shine Award. A limited edition pamphlet, Father (Bonnefant Press) was published in 2015.
that it would remember us by? The life that you are seeking you will never find. In time, you shall be dust. Bethany W Pope is an award-winning writer. She has published several collections of poetry: A Radiance (Cultured Llama, 2012) Crown of Thorns, (Oneiros Books, 2013), The Gospel of Flies (Writing Knights Press 2014), and Undisturbed Circles (Lapwing, 2014). Her first novel, Masque, is due out from Seren in 2016. This autumn THW will be publishing her chapbook, Dust. flat packed dead in their wedding gowns. I couldn’t have placed you here, in this wind. back onto you, and children squeal on trampolines. left to you cling like limpets in your dark. Wendy Pratt lives just outside Filey, North Yorkshire. Her latest collection, a pamphlet entitled Lapstrake, is published by Flarestack Poets. She also has a full collection and another pamphlet with Prolebooks. Wendy was highly commended in the Forward prize and also won both the Prole laureate and Yorkmix competitions in 2015.
windows, street lamps, earth forms netted in lights. for sustenance? Tell us it has not been all in vain. It will come to more yet and take my cold hand. that we should see such clarity again. free thought walks in the sky by day and night. the football fields below. A goods train passes through. recognises at long last the day of the many. to our patience and assurance. our numbers are called in finally. Peter Riley was born in Stockport in 1940 and recently retired from Cambridge to Hebden Bridge. He is the author of fifteen books of poetry, and some of prose concerning travel and music. His most recent books are The Glacial Stairway (Carcanet 2011), a book-length poem, Due North (Shearsman 2015), which was shortlisted for the Forward Best Collection Prize in 2015, and Pennine Tales (Calder Valley Poetry 2016). in the flanks of beasts. Fiona Sampson has been published in more than thirty languages, and received various national and international awards. Professor of Poetry at Roehampton University, she is at work on a biography of Mary Shelley, and a study of musical form in poetry. Her latest collection, from which these poems have been taken is The Catch (Chatto & Windus, 2016). in the closet like my mother’s rabbit fur coat. in skinning an identity, sloughing off a marriage. – and then puts down. secreted in a buggy’s undercarriage. trolley stacks? It is just ordinary regrets. a sigh of prayer books closed as footsteps pass. the clank of spade on stone turning turf outside. that floods in through the tall clear windows. Emma Simon has been published in various magazines and anthologies. Last year she one of the poets selected for the Jerwood/ Arvon Mentoring scheme. She won the Prole Laureate competition in 2013, and was commended in last year’s Battered Moons poetry competition. She lives in London, where she also works as a part-time copywriter. K.V. Skene’s work has appeared in Canadian, U.K., U.S., Irish, Indian, Australian and Austrian magazines, most recently in Crossing Borders, (Canada), Acumen (UK,) REAL (USA) Obsessed with Pipework(UK)’ Envoi (UK) and Orbis (UK) Her latest chapbook, Under Aristotle Bridge, was published this year by Finishing Line Press (USA). What odds, my aunt said, What odds. to Moss Side, but you were gone. to 1903 but it didn’t run anymore. There was no Suffragette City left. wire, or smashing a few windows. in order to deserve to walk in there. also a long black curly wig. then drove to the Gay Village. song? ‘Lola’, by the Kinks. The applause is still ringing. of their graves to applaud. made, so you can clean up. they’ll ply you with green beer. or even dogs, but not cats. with a side-interest in grappa. sunglasses and a porkpie hat. as I blunder down the corridors. and try to get to the moon. with that of your imitators. Why? Not one of them gets you. You were the numero uno. smuggled into the figure of Judas. before twenty of your acolytes’. Michelangelo Meriso, you’re the one. Matthew Sweeney‘s most recent collection is Inquisition Lane, published by Bloodaxe in October 2015. It was reviewed by Angela Topping in THW #1. His previous collection, Horse Music (Bloodaxe, 2013), won the inaugural Piggott Poetry Prize. or I, could do to right it. Sheila Wild lives in the South Pennines. A policy analyst and non-fiction writer, her award winning poetry has appeared in journals such as Orbis, The North and The Rialto. Her first collection, Equinox, is due out from Cinnamon Press in May 2016.
is tough through clay and roots. they’ll lay a winding path from end to end. perfection – human beings boxed, brutalised. we call suffering? The want of time? to manage, monitor, report on us? will read them when they do? beyond the fence, the chip; the guns, the screen. our light doubled against the darkness. James W. Wood is the author of three chapbooks and one full-length collection, The Anvil’s Prayer (Ward/Wood, 2013). His work has appeared in the TLS, Poetry Review, The North, Stand, Critical Quarterly and many other publications. The High Window have just published The Emigrant’s Farewell, his long poem about the migration of the Scots to Canada. the fierce white crumbs of china. the blue lotus flame of the gas. He has just discovered the painting. to a world that he knows. for a burden like this. who almost certainly aren’t there. A grown man, how has he come to this? feel the kiss of rough serge. slip one behind an ear. (my arm proud with its new stripes). would have been enough . . .
a chromosome’s difference, the war’s luck. Mount Fuji in one corner. to a whole white wall – he had to tunnel out. like trefoil tracks of birds, in endless snow. Dorothy Yamamoto grew up in Barnet, north London, where her Japanese father and English mother settled after the war. That divided background is the source of many of her poems. She now lives in Oxford, and writes non-fiction books about animals as well as poetry. Her collection, Landscape with a Hundred Bridges, came out after she won the 2007 Blinking Eye competititon, judged by Don Paterson. What a Great Wangdoodle of an issue!